This was a magical season. That's not hyperbole. 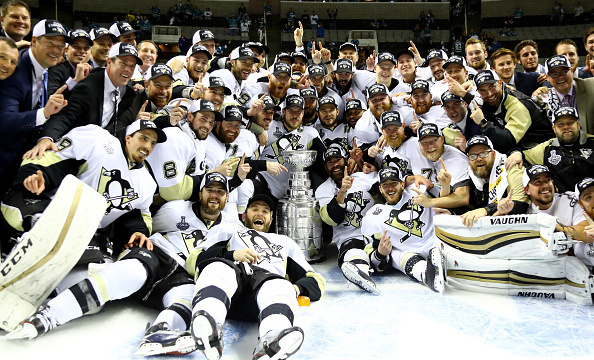 Everything about this season, this Stanley Cup Championship felt different than the others. If you're a fan or follower of the team, once the team started to turn the corner in December you could feel the energy shift. You could feel it in Consol, you could feel it in the city, you could feel it in your living room. A lot of fans will tell you that they knew months ago that the Pens were going to win the Cup this season. And that's not arrogance. Watching this team play and watching them transform from cast-offs to contenders under Mike Sullivan's guidance, it was clear that you were watching history being made. We're sincerely grateful to every one of our readers. It's been a pleasure to have you along for the ride this season and we have no plans to slow down during the summer. We always aim higher. Paul Clemente (@evil_shero) - I’m going to turn in my “cool blogger” card and say that I was confident that this would be the result back in April. The Penguins just did too many things right, they were just too good, they were the team they needed to be to win. I let my son, Vinny (8), stay up to see the game. Every morning after a game, the first sentence he would mutter - with his eyes still closed - was “Dad? Did the Penguins win last night?” That was his very first thought starting the day for almost two months now. I can only hope he recounts this night as one of his fondest childhood memories. He passed out during the 2nd period under the coffee table in a Penguins themed micro-fiber burrito. My fiancee and her son were sitting on the couch next to me and it was strangely silent in the living room. I was so focused on the clock accounting for every second spent. Her son proclaimed at the beginning of the series that he’s always been a lifetime Sharks fan and tried his best to cheer them on. Nothing bothered me, I was watching the pixelated white numbers dissolve to zero. I can tell you, today, I can’t get enough pictures, videos, coverage, blogs, podcasts, interviews and anything else I can absorb about Sunday night’s win. It can be the last Cup in my lifetime, it could be the beginning of a new dynasty; I don’t really care. I am loving this moment in time in which I can celebrate my favorite thing on the planet. I woke Vinny up with 30 seconds to go in the game. He wobbled around and forced his eyes open and watched the blurry colors dash across the screen. As the final moments burned new moments into NHL history, he watched silently. The Penguins celebrated as his young mind took it all in. He didn’t scream, or cheer, or dance. He just hugged me without a word. I held his tiny frame close to me knowing that this photograph in time will forever be a memento of his childhood. Hockey did this for us. The Penguins did this for us. Will Hirsch (@williamahirsch) - I was watching Game 6 in my apartment. My roommate wasn’t home at the time so I was alone eating my cup of Sweetfrog frozen yogurt (cookies and cream frozen yogurt with chocolate chips, rainbow sprinkles and M&M’s mixed in). Honestly, my kind of night. When the Pens won the Stanley Cup I immediately thought about all the highs and lows the fan base experienced this season. From everything going wrong to everything going right and the team barrelling towards winning the Stanley Cup. It just seemed like it was meant to be. It made for one heck of a story. Being able to be a part of history and writing about the transformation of the Pens over the season has been really neat. It’s something I can’t ever recall seeing. It’s certainly something I’ll hold dear for the rest of my life. I’ve learned so much about life and the game of hockey from this season. Stacey Miller (@SpinMeWrite) - This Final was a peculiar one for me. My boyfriend of three years is a die-hard Sharks fan. There's been a constant chirping in my ear about the Sharks. For the time being, he's in Boston and I'm in Ohio which was probably for the best. Before the series started we trash talked (not cutesy trash talk but some filthy, unprintable words) and ordered a bunch of Stanley Cup swag. As the series went on, we talked less and less about hockey and after the Final, I didn't hear from him until 15 hours later. He's still coming to terms with the loss. I was living in Georgia and working at a bookstore for the 2009 Cup. The only games I was able to watch on my little 17" TV were the Finals. I moved back to Ohio last year after spending two years in Flyers territory (blerg) and I'm so happy to be back in my hometown area where I was able to watch nearly every game this season. Because this season will be hard to top. I watched the game at home by myself, which is usually how I prefer it. I like to watch the game and don't want to be bothered by other people. I want to soak it all in. For that reason I detest Super Bowl parties. When it was all over, I sat in awe on a milk crate right in front of my TV like I was a little kid again. I didn't want to miss any part of the celebration. When Sid unexpectedly handed the Cup to Trevor Daley first, tears were streaming down my cheeks as I realized just how much he means to the Pens. (And then I cried some more when I found out why he picked Daley.) I was livid with the way NBC handled the channel switch to NBCSN because all I wanted to see was Phil Kessel hoist the Cup. I've since watched it on social media, but that's not the same as watching it live. This was a tough year personally and hockey was my escape. I connected and fell in love with this particular team. I'm thrilled I get to write about them. I just graduated with a writing degree, so writing about something I'm passionate about has meant the world to me. Non-fans poke fun at fans for taking it too seriously when it's "just a game." It's so much more than that. I've formed strong bonds and critical skills through sportsing. It's not just a game. It's life, man. Jeff Furmanchin (@jfoo1654) - Almost three years ago, my fiancee Amanda and I had our first date. I had decided I would take her to a WBS game with me, because if she couldn't handle my love for all things hockey and especially the Pens, we might as well find out quickly. She was totally hooked from the drop of the puck, maybe even before. The next day she had a season ticket directly beside me. Sunday night felt like the culmination of a three-year hockey lovefest. We are due to be married in October, and what an early present Lord Stanley delivered us. As we sat biting our nails and full of anxiety, I couldn't help but look at her nervously watching and clapping at Chris Kunitz’s goal-saving diving play and think just how unbelievably lucky I am to have her by my side. Her favorite player is Conor Sheary and she jokes often about how beautiful he is. Only I know she isn't joking, she really loves him and melts every damn time she sees him. But hey, that is just fine with me. Why? He’s a Pittsburgh Penguin! Let’s be honest, I love him too, just not for his looks. We hugged it out and damn near cried (maybe a tear was shed) as Trevor Daley handed the cup to Duper. We sat quietly as the cup got passed around and luckily for NBC they cut back to the ice just as #43 lifted the cup, otherwise she would've given them hell. Anyway, when the Penguins were done celebrating on the ice and I laid down to go to sleep I simply felt blessed. Blessed to have a beautiful fiancee who shares my passion for the greatest sport on earth. Blessed for my new friends and hockey family at Pens Initiative, who have honestly made my dreams come true. And blessed to be a fan of such an outstanding franchise, one that gives us so much to be proud of, and one that gives us so much to be thankful for. Medina Menozzi (@Medina_Marie17) - It is hard for me to put into words what this season has meant to me. Like the team, so many changes have gone on in my life. All I hoped for was a positive outcome at the end. Seeing how the Penguins were able to battle through the hardest of times this past season gave me hope that if I just keep checking, just keep digging and not give up, eventually I will get free for a better opportunity. Who knew those opportunities would come at one of the hardest points of my life. Being brought on as a writer for Pens Initiative has been amazing. I am so thankful and blessed to be a part of something that is greater than myself. I am honored to be a small part of this Penguins season. My fellow writers, and now friends, have been a gift that I will continue to cherish. Being a part of PI is allowing me to build myself and my skills as a sports writer so that I can maybe one day have a shot at the big time. It takes one shot...and the entire game can change. That game being life. Anyhow enough of the sappy stuff. Where was I when the final horn blew? I was with 15,000 Penguin faithful packed into Consol Energy Center, including some Twitter followers of mine who have become very good friends. It was like an actual game only there were no players on the ice. By the time the third period rolled in I was a mess of nerves. I could not sit still. I legit almost passed out when Letang and Hornqvist scored. All energy left my body and I felt my knees buckling under me. I had to grab onto my friend, Justin, for support or it would have been “Woman Down”. I am not ashamed to admit I cried. I cried like a fan girl in front of a boy band in the 90s. All the emotion from the past few months came pouring out. I remember how I felt in 2009 and it is nothing compared to how I feel now. It is a little over 12 hours later and I am still riding a high...or maybe that is the lack of sleep. I also have no voice which doesn’t bother me one bit. I cannot wait to scream myself hoarse again at the parade. Brian Keenan (@BrianK_PI) - I still don’t think reality has set in for me. Earlier in the series, when it began to become apparent that this team would win the Stanley Cup, I questioned how I would respond to that moment when the buzzer sounded and officially proclaimed Pittsburgh the champions. Would it be a jolt of adrenaline and exhilaration rushing through my veins, or would tears of happiness find their way from the corner of my eyes? It turns out that I’d be overcome by laughter, that the team that looked at one point to be easily the worst since the Cup win in 2009 turned out to be quite clearly the best. But not only would the Penguins win their fourth Stanley Cup, but they’d be thoroughly dominant against a strong team many predicted would be enjoying this moment instead. And after living and dying through the first 40 minutes with every shot towards the Penguin net, and every pass that found a San Jose stick in a danger area, the dominance that limited the Sharks to just 2 shots on goal in the final period with their season on the line almost seemed foreboding of impending doom, as if it were the calm before the storm. But not this team, not this time, and not a chance they’d fail to finish the job. Maybe it didn’t follow the script for those who prognosticated a dynasty in the making, and maybe it didn’t go as planned for a city desperate to lift the Cup on home ice, but certainly it doesn’t get any better than this. The window shut on this team and they burst through the front door instead. Now and forever, they won’t just be known as resilient - they’ll be known as Stanley Cup Champions. Nick Case (@Nick422) - At the start of the season I was burned out on hockey. I’d just finished working for a team that lost the ECHL championship and I was spent. Uninspired play by the Penguins and a lack of interest made me just… well… not care. I continued to watch and cover the team but was merely going through the motions. Then it slowly began to change. Trades, firings, promotions. The team was fun again. They were fast, they were scoring. Crosby and Letang broke out in a big way and the team was firing on all cylinders. For the first time in a while I was looking forward to the playoffs. Round by round went by, the train continued to grow steam. As I worked in different cities I’d find a place to watch each game. Wilmington, NC, Rome, GA, Greenville, SC -- I had to watch. In the past I’d just catch the highlights. Game 7. Eastern Conference Finals. The stress and the anxiety were there but deep inside I knew they’d win. When they did I was dying to be a part of this magical ride somehow, some way. On a whim I bought Game 2 tickets from a friend. My girlfriend found someone to cover her shift on the day of the game. We drove 13 hours on a Monday from Charleston, SC, to Pittsburgh for a Wednesday game. On Tuesday we were engaged at the top of the Duquesne Incline. On Wednesday we went and saw the Penguins win a Cup Final game in overtime. A week later we watched together as the Penguins lifted the Cup. A season that started out with a severe lack of interest, one that made me question why I cared or why I was buying tickets to see them four hours away, ended with me driving 13 hours for the trip and experience of a lifetime. To say I was a part of it as I watched, with my new fiancee, as the Penguins won a Cup Final game in overtime… it’s something that will be hard to top and I will never forget. To know it ended with them lifting the Cup was the perfect exclamation point on the end of a strange, wonderful fairy tale of a season. One that I still can’t believe happened.